With newly sprouting leaves, leftover debris and pine needles from winter storms, and fluttering leaves and wayward branches floating around, the potential for rainwater overflow when it comes to your gutters starts to mount come the end of winter--leading to the need for a second gutter cleaning almost every year. That built-up and overflowing water can cause water damage and landscape erosion to the inside and outside of your home, which means that, despite being a tedious and often time consuming task, gutter cleaning is essential to the longevity and well being of your property. Luckily, there are some tips and tricks that can make this age-old chore just a little easier on you. It may seem basic, but having the right tools for a simple job is essential. And in the case of gutter cleaning, it doesn't get much more basic or essential than a quality, sturdy ladder. Wooden ladders can be wobbly and uneven, creating a safety hazard. Instead, look to fiberglass (which, despite being the sturdiest, are also the heaviest, which can lead to muscle fatigue over the course of a large job along a larger home) or aluminum. If at all possible, find a ladder with a small shelf where you can keep a bucket for collecting debris, and attach the bucket with a cord or lanyard. Before going near your gutters or roof--especially with an aluminum or metal ladder--conduct a visual inspection of all electrical cables. If the protective wire insulation that surround the cables that connect to your roof has rubbed away, don't touch or attempt to repair them yourself. Call your electric company or a licensed electrician before attempting to clean your gutters. 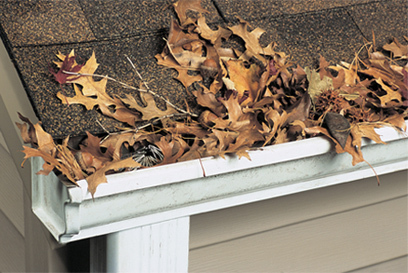 If winds and rains have swept leaves and other debris onto your roof, you'll want to push those leaves, branches, pine needles and the likes off before starting to clean your gutters, as the next storm that rolls along will simply wash it all down onto your freshly washed gutters, clogging them right back up. Like the right ladder, you might not think about your shoes right away when planning your gutter cleaning day, but it's really the little things that can make the biggest differences. Rubber soled, closed toed shoes will adhere best to ladders and roofs, helping to prevent slips and falls. Remember that Rooftops can be wet and slippery first thing in the morning, so plan on starting your project in the late morning or early afternoon. If it's about time to replace your gutters, or if you're simply tired of climbing to the roof and dealing with standing water and slick, slimy leaves twice a year, you might want to consider clog free gutters, which require much less maintenance over the course of their lifetime. A patented, one-piece gutter system, these types of gutters include a seamless gutter and a built-in hood that deflects leaves, dirt, debris, rodents, pine needles, and more.